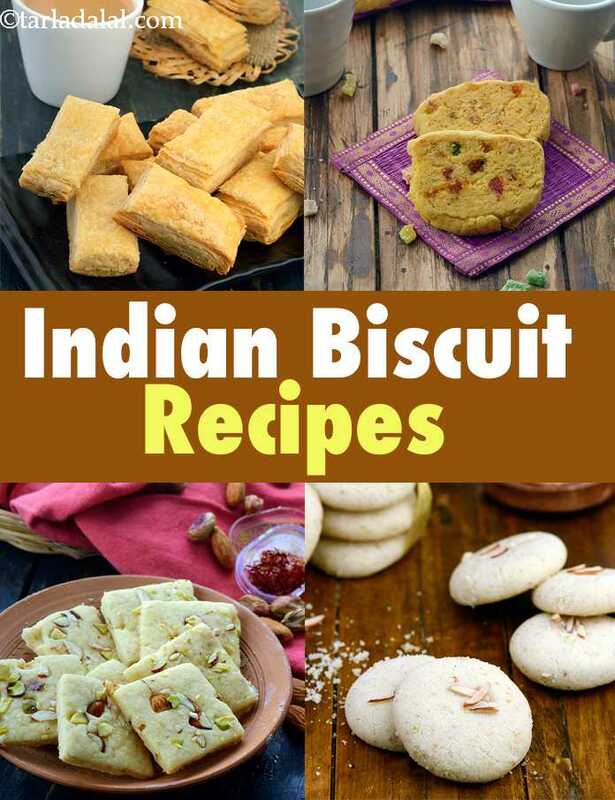 Indian Biscuit Recipes. Biscuit Recipes. Waking up in the morning to a cup of tea/coffee with a biscuit for breakfast is a ritual in most Indian households. While Indians enjoy chai-biscuit, everywhere else in the world people enjoy cookies & biscotti with their tea. Most Indian biscuit recipes are made using plain flour or a combination of flours, leavened using baking powder and baked in an oven. Indian biscuit recipes are generally flavored with spices like cardamom, nutmeg or cinnamon. One thing that you must remember to get the best result is to use fresh ingredients. Also, after taking them out of the oven, cool them completely till they get crispy. Nankhatai, a popular Indian biscuit is made with semolina & plain flour. Also, the recipe makes use of butter, powdered sugar and other rich ingredients like almonds, pistachio and cardamom powder making it a melt-in-the-mouth treat. Another delicious Indian spiced eggless biscuit is this Atta Biscuits. Made with just a handful of ingredients, they are the perfect biscuit to dip in a cup of masala chai. If you are not a fan of sweet biscuits, then try making a batch of jeera biscuit or Oats and Cinnamon Biscuits. These savoury biscuit recipes are easy and quick to make, so you can go ahead and try it out right away!! One of my personal favorite Indian biscuits is the khari biscuit. This jar snack can also be packed in kids’ tiffin boxes or served as an evening snack with a glass of milk. The flaky biscuit when topped with a cheesy mixture to make Cheesy Puffs vanishes from the plate in no time. Some ingredients like cocoa powder, cheese, gems, jam are most enjoyed by kids. How about incorporating them into biscuit recipes to make delectable treats?! Try your hands on biscuit recipes like Caramel Cookies with Eggs, Cheese Biscuits or simply Jam Biscuits. Addition of powdered dry-fruits like cashewnuts and almonds help in making crumbly and irresistible biscuits like Almond Butter Biscuits, Eggless Cashewnut Biscuits. Serve with hot Elaichi Tea or coffee along with other evening tea snacks. If you wish to make biscuits with a pleasant, crunchy mouthfeel then try making Kesar Pista Biscuits or the Karachi Biscuits. We are sure you will forget store-bought biscuits once you start making these recipes. A crumble made by mixing butter & biscuit generally forms the base of cheesecakes but, you can also make many delicious desserts by layering biscuits with a myriad of confectionery ingredients. Craving something sweet post your meal? Quickly assemble some nice biscuits to make this yummy Chocolaty Biscuit Cake. Layered Fruit, White Chocolate and Coconut Biscuit Dessert is another quick and easy dessert recipe using coconut biscuits. You can use any fruit that is easily available. Coffee lovers can try their hands on delights like Coffee and Biscuit Parfait that requires just a handful of ingredients. Enjoy our Indian Biscuit Recipes, Biscuit Recipe and other starter snack recipes provided below.